FILE - A Chinese man stands alone to block a line of tanks heading east on Beijing's Cangan Blvd. in Tiananmen Square in Beijing on June 5, 1989. Rights activists in Hong Kong are set to commemorate the anniversary of China’s Tiananmen Square protests, once again calling on China to revise its official explanation of the event. Sunday marks 28 years since Chinese tanks rolled into crowds of demonstrators in Tiananmen Square, opening fire and killing hundreds of pro-democracy activists. Some estimates put the total number of dead in the thousands. 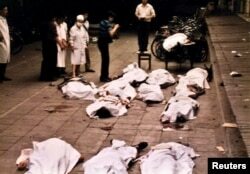 China’s government refers to the event as the June 4th Incident and downplays its severity. Discussion of the event in media or textbooks is largely forbidden. But in Hong Kong, activists remember the June 4 protests every year and mourn the victims. Richard Choi of Hong Kong’s Alliance in Support of the Patriotic Movement in China told reporters this week that the group’s work “will remain unfinished” until the government revises its official explanation of the event. 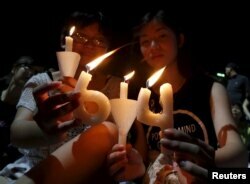 FILE - Pro-democracy supporters hold candles in the shape of "64", which symbolizes "June 4th", during an annual candlelight vigil at Victoria Park in Hong Kong, China, June 4, 2015 to mark Beijing's Tiananmen Square crackdown in 1989. While some say that Chinese born after 1989 are largely unaware of the Tiananmen Square protests, Choi said students and other young adults in Hong Kong are keeping the memory alive. Britain gave Hong Kong back to the Chinese in 1997, but it has retained much of its traditions of free speech and association. Critics, however, say those freedoms are being weakened as time goes on. Lee Cheuk-yan, another leader of the Alliance in Support of the Patriotic Movement in China, told reporters a candlelight vigil his group is hosting Sunday also is a way to express anger at Chinese authorities ahead of the 20th anniversary of the British turnover of Hong Kong to Beijing July 1. FILE - Medical workers at Beijing's Fuxingmen Hospital look at bodies of protesters killed by soldiers around Tiananmen Square on June 4, 1989. Human Rights Watch called on Beijing this week to acknowledge its role in the deaths of the Tiananmen Square protesters in 1989, and allow Chinese citizens to commemorate the event. It also called on Chinese leaders to release people imprisoned for speaking out about the protests in the past. The Tiananmen Square protests were born out of peaceful protests held in public in several Chinese cities in April 1989, calling for freedom of expression and an end to government corruption. The Chinese government responded by declaring martial law in May. 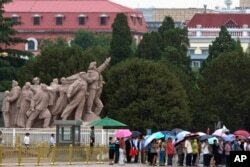 FILE - Visitors line up on Tiananmen Square on a rainy day in Beijing, June 4, 2015. In what's become an annual ritual, Chinese police were stepping up their vigilance in the capital Thursday to prevent any remembrance of the event. On June 3 and 4, members of the military opened fire on the demonstrators in Beijing. Some fought back by attacking military convoys and setting military vehicles alight. The government responded by cracking down on dissent and arresting thousands for counterrevolution, arson and disrupting social order. While some of the protesters and supporters have since died or otherwise gone silent in the past 28 years, new evidence illustrating the event is still surfacing. On June 1, The New York Times published photographs taken at Tiananmen Square in 1989 by David Chen, then a university student and pro-democracy organizer, who moved to the United States in 2012.